I shared nine fantastic years with my dog Daisy who sadly crossed over the Rainbow Bridge in April when she was 13. She had arthritis from the age of four when I first rescued her, but was so lively and only slowed her down in her final few months. Two months before we lost her, Daisy was diagnosed with dementia, and a week before she passed her vet suspected she had a brain tumour. Caring for a senior dog is both rewarding and heartbreaking and I found the advice on this website so helpful and comforting. 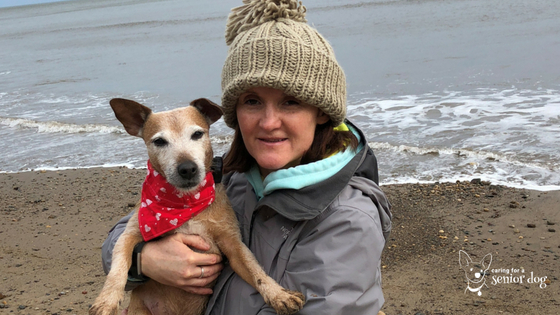 You go through so many emotions and it can be difficult, so I wrote this article about some of the things I learned caring for Daisy in the hope it will help other owners. All dogs love snoozing in the day, but I learned not to let Daisy sleep for long periods. One of the signs of dementia is restlessness at night. Before Daisy was diagnosed we had a few nights where she woke up at 2am and wouldn’t settle. I took her to bed and she either sat shaking, wide awake or circled around the bed. So we’d go for a walk and eventually she would go to sleep. Her restlessness and insomnia were on the list of unusual characteristics that we took to her vet who said it was most likely she had dementia. In the final months, she would settle in her crate on a huge soft pillow, or sleep on a comfy bed, with blackout blinds or with me in the human bed. I also monitored sleep quality with her FitBark activity monitor. Like many owners, I was guilty of using my phone while out walking with Daisy until I learned how our pets hate it. I made sure walks were special time for the two of us. Sometimes I’d take her ball and do very small throws for her – a modified version of something she really enjoyed. Some dogs might not want to walk quite so much, or not fancy going out in the cold weather but it’s important to keep them mentally stimulated. Play games at home with them. Daisy liked her tug toys and games where we hid treats under cups for her to find them, and we used a Ruffle Snuffle enrichment mat and a Lickimat too, both were really reasonably priced and gave her a lot of happiness. Your dog might not be bounding around like they used to or tend to sleep more but giving them your attention often is still really important. When Daisy was diagnosed with dementia I was recommended a book called Whole Pet Healing by an American vet, Dr Dennis W Thomas. He talks about the benefit of giving dogs wholesome, balanced meals rather than processed food and explains that as dogs age, their body temperature can start to cool. They seek out warmth, for example lying in the sun or by a fire or radiator. Daisy did this and Dr Thomas said to give her food that is warming in nature to offset the cold imbalance. As I work from home I had the luxury of being able to cook for Daisy so I made her slow cooked casseroles with chicken, beef or lamb and rice or potatoes and veg served warm. She had wet food so she had the nutrients she needed. It meant she enjoyed her food, took her medication without a fuss and was a happy girl. Warming foods are chicken, beef, lamb, venison, white rice, oats, asparagus, carrots, potato, pumpkin and butternut squash. I read a book called Remember Me by Eileen Anderson with lots of helpful advice including tips on how to minimise the stress of taking medication for your dog. Find a food your dog loves – Eileen suggests all kinds of things from meatballs to peanut butter. Daisy had two Vivitonin tables a day which ideally should be taken on an empty stomach. Her vet said they could be put in a tidbit so I’d wrap them in a piece of slow cooked meat or inside a sausage. I kept tablets in the fridge too – it helps disguise their taste. You don’t want to distress your dog when they take their medication. Her Activait and YuMove supplements were mixed in with her food and I ensured her food was so nice she didn’t care! Daisy also had Metacam for her arthritis, and I gave her this in a syringe just as I put out her food bowl. The excitement of her food distracted her. Daisy never used a crate, preferring to sleep on the sofa, but when she reached the stage where she could no longer jump up, she grew to really love her crate. We kept the door open and it had a cover so it would be dark at night, with a huge comfy bed, a soft blanket and toys. We put down rugs, runners and carpet tiles so she didn’t slip as recommended by vet Hannah Capon who runs the Canine Arthritis Management website, which is full of helpful tips. Daisy had a pet carrier/bed and a pup-poose for when we were out if she got tired. A week after Daisy was diagnosed we went for a walk along the canal. She was scampering around as normal, and went for a wee at the side of the water, lost her balance and slipped in. Thank goodness she was OK and I had her out of there in a nano-second. I very quickly learned that cognitive function is affected by dementia and Daisy’s behaviour wasn’t as logical as it was. She would lie on the edge of the couch for example, so I’d coax her to her normal spot so she didn’t fall off, and had soft rugs on the floor. Daisy would sometimes walk along walls or on the edge of paths, or very close to me so you have to watch your dog at all times. This may sound silly but even things like grids at the side of the road become a hazard. Daisy’s legs were so slim they could get trapped in them and before, she knew to walk around them so I’d ensure she didn’t step on them. Make sure you’re always scanning your walks for things that could present danger. It’s natural to be upset when you learn your dog has a degenerative illness. But life doesn’t stop with an older dog, it simply changes. Celebrate the good times and help them enjoy life. If Daisy was having a good day, we’d seize the moment, pack up the car and take her on an adventure. We didn’t walk for miles and miles like we used to, but she still enjoyed a run out. Daisy loved new smells so I’d take her to different places and see her spring around like a pup. She enjoyed home cooked food so I’d sneak her tablets in there and watch happily as she wolfed it down. When Daisy growled at us at night we knew it was her illness, not her, so we’d give her a cuddle and tell her everything was ok.
We treasured each day we had with her. I knew when Daisy wanted to go. As well as dementia, she had a brain tumour and it was a ticking time bomb. Our vet told us that around the corner was a haemorrhage or seizure which would have been terrifying for Daisy. We took some time to digest the news and in those few days, she declined quickly. On walks she was frightened, darting around as the tumour was pressing on her optic nerve and she couldn’t see. We’d return home and I’d cuddle her for hours, playing music to calm her down. Her frightened episodes became more and more frequent, and even though she was eating, going out to the loo and walking, I knew this wasn’t how she wanted to live. Daisy had been a tough, independent dog who survived on the streets and had so much spirit. The light in her eyes had gone. So on April 17th this year, the vet came to our home and put Daisy to sleep. It was peaceful, with us sitting next to her stroking and cuddling her and telling her how much we loved her. I still question myself now. Did we do it too soon or too late? I will never know but I feel I did my best for her. For nine years Daisy gave me so much love. She was my best friend, my rock. I still can’t imagine life without her. I never wanted to say goodbye and even though it was the worst moment of my life when we did, I think it was the kindest thing. 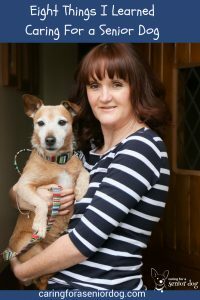 Rachel Spencer is a freelance journalist and specialises in writing about pets and animals. 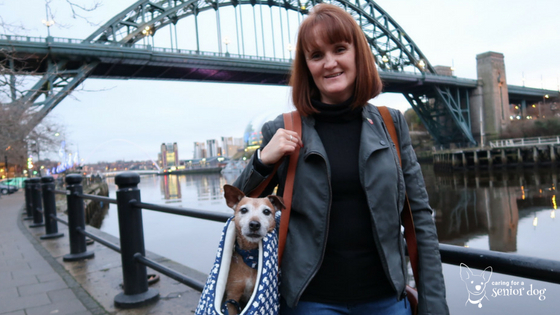 She lives in Newcastle-Upon-Tyne and runs a pet blog, The Paw Post which was inspired by Daisy and will continue as her legacy. I lost my two elderly dogs Heidi and Hans and I still miss them. They lived a long life. Heidi was 19 and Hans 17 when crossed the rainbow bridge. Your Daisy is beautiful I am so sorry she is not anymore with you. Providing good quality life is key for having them last longer and endure the difficulties of being elder. Rest assured you gave her a wonderful life. I know it is a difficult decision to let them go. I also questioned myself if it was too early for them to be put down. But what comforts me is that they know I love them and always tried to make the best decisions to provide the with a happy life even at the end. Aw thanks so much for commenting Adriana, and for your lovely words. Your pups lived to a fantastic age – and you’re right – you do question yourself but I feel in my heart I did the right thing. I just miss her – thanks for being so kind. My little one turns 8 in June. His life expectancy is about 18 years so … we have a ways to go yet. But I love reading articles like this because it’s good to know ahead of time. And I only take my phone out for a photo op if it comes up! You are right … they hate it!! Thanks Sonja, I’m really pleased you found it helpful as so many owners put things like arthritis and dementia down to age/blindness and there is a lot we can do to help our dogs. Daisy loved posing for pictures, but if I took my phone out to do anything else she didn’t like it at all! Thanks for commenting and enjoy many happy years with your pup. I’m very sorry for your loss. It’s very obvious that your Daisy was well loved, and your dedication to making her final months with you the best they could be is admirable. Making the decision to end a pet’s life seems to always come with questions about too soon/too late, no matter when it’s done or what else is going on with them. I think that’s just human nature. Thanks so much Julia, it means a lot that you think I did my best for her and thank you for your kind words and understanding. I can honestly say that Daisy has the best dog mum in the world and you have provided so much care that I know she will have felt so safe with you. I am sorry you lost such a gem of a pup. 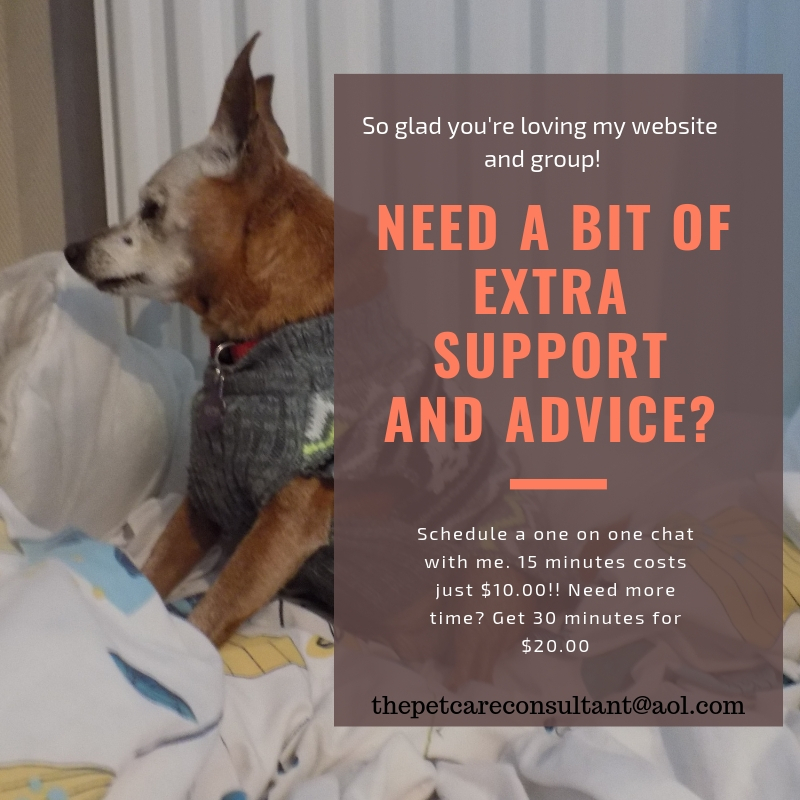 Your post will be such a help to anyone dealing with dementia in a dog, so thank you. She was indeed a gem, and I’m glad you found this helpful. 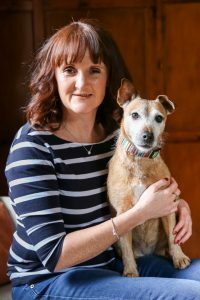 I think the work Hindy does with dementia awareness and information on life with a senior dog is so important and it really helped me over the last few months. That’s why I wanted to share my experience and I’m really pleased others are finding it useful. Mr. N has a snuffle mat and Lickimat both of which he enjoys. I mix in his supplements with his food and he doesn’t seem to mind. He’s picky about chews but I found a joint supplement that he likes. Aren’t they brilliant? Are you in the UK? Daisy had a Greggs steak bake in her Lickimat – not sure that’s what they had in mind when they created them but it made her very happy! Thanks for commenting and hope Mr N is ok. I learned so much from your post. My Chipper had gotten restless at night during his last few months, and I didn’t think it was dementia. I had not heard of some of the things you mentioned and will look into them such as the fitbark, ruffle snuffle and the wellness book. I also didn’t realize dogs stressed over getting their medications – I thought it was only us! It sounds like Daisy had a great life and a wonderful caregiver! I’m sorry you had to lose her, but it sounds like it was her time. I also had a dog with a brain tumor who went downhill very fast after she was diagnosed.Siezures were also my concern since I didn’t want her to suffer. This had me in tears. I’m so sorry for your loss of Daisy and sending you only positive healing vibes your way. I totally understand what you’ve been through having cared and loved for a senior pet with an illness. Many of the lessons you’ve learned I can relate to as well. I think you really set her free. As Daisy’s mom you know how she’d want to live her live. The best gift was to be able to release her from her illness at home surrounded by love. I wish I had known this was an option when I had to send my cat Dusty to Rainbow bridge. Pinning your post for other bereaved/senior pet parents to read. Thanks for sharing such a personal touching testimony. I’m sorry for upsetting you – it’s such an emotive subject isn’t it and thank you for your kind words. I’m really pleased I’ve shared this as having people reassure me I did the right thing for her is a comfort. Thank you and I’m sorry to hear about Dusty, I’m sure you did the best for her too. Thanks for commenting. This was so beautifully written! 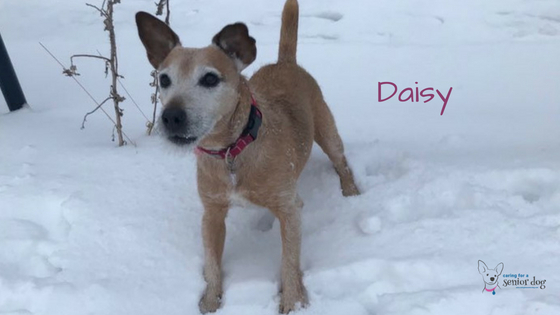 What a wonderful tribute to Daisy and such great advice for other pet owners with senior pets. We never know if we make this decision too early or too late, but what is true is that we don’t make it lightly or hastily. When we were going through this with our 16 year old labrador, Burton, it was heartbreaking. He was our child before children and was the absolute best dog in the world. But in the end, he told us when it was time. Not a day goes by that I don’t mention his name or think about him. I try to focus on the great stuff – him leaping in the pool, camping with us, going to the beach, eating my husband’s hat,… I’m so sorry for your incredible loss and pray for healing. Thank you, that’s really kind of your to say. It certainly wasn’t a decision we took lightly and as it was for you and your dog Burton it was heartbreaking but I think they do tell us when it’s time and little Daisy had had enough. I know it will take time and we can never replace her – not that we would want to – but we are thinking about the happy times more now. I think that’s part of the grieving process isn’t it? Thank you for commenting. I’m sorry to hear about Mr Chipper, like you it took me a while to realise what was happening with Daisy. I wrote down all her symptoms and took them to the vet, but I remember looking at them and I just knew. Thank you for your kind words too, they are very much appreciated, and I really hope the things I have suggested help. There are lots of toys around (I don’t know if you’re in the UK or US) that can help, but I found the sleep tracker on the FitBark so helpful. Thanks so much for taking time to comment and I hope Mr Chipper is ok, it sounds like he has a great dog mum from your post. My Jack turned 18 in April. He was my husbands dog for 14 years before I met him. From day 1 I knew I loved jack just as much as my husband. Next week on the 17th will be the 2 year anniversary of My husbands death. Jack has held on the last two years as much as he could. Just like me. He’s had a lot of health scares since hen but somehow managed to come out ok. Until now. I contacted a pet psychic because I needed clarity. I needed to know from jack what he wanted or needed. He said Josh is calling him. He’s waiting for him. He pleaded for me to let him go. It’s all too coincidental that the day josh died is coming up. On the 17th, I will have to let go of the other love of my life. 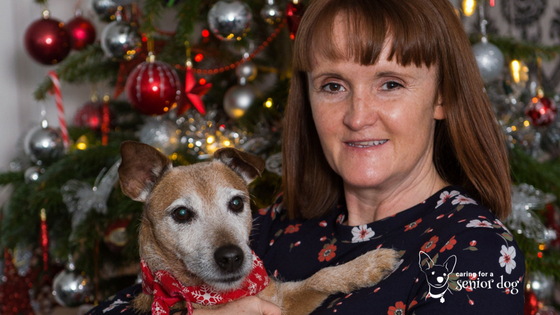 Oh my goodness Lindsay I am so so sorry to read this – I can’t imagine what you are going through losing your partner and now Jack being poorly. I wish I could help but it’s so hard. All I can say is to follow your heart and if you think it’s the right thing to do to let Jack go you will know. Sending lots of love and will be thinking of you on the anniversary. What a touching story, thank you for sharing. Thank you everyone for sharing these experiences. We adopt older and special needs dogs and do our best to let them re!ax into their final years after they have been rescued from various awkward predicaments. There are many good ideas in Rachel’s moving article which we will be able to use with our little ones now and in future. There are not many words to take away the pain that strikes from the moments when we look at our mature companion animals and suddenly picture their decline, to the moment when they leave us however peaceful their ending. One thing I have finally learnt is not to push away the memories when they visit because the loss is just to painful, but instead to cross my hands and cuddle them closely to me. I try to treasure these times and although still very sad, I find that I am not so fearful. I lost my toy poodle Merlin six weeks ago and the missing is like a solid block chained across my middle. We only have one dog , Baby, just now and he is at least nine years old and very creaky. He isn’t very comfortable being the target of too many cuddles! So, I am looking to adopt a new friend for him. I have found over all these years of making regular visits to the foot of the Rainbow Bridge that giving another animal in need a home and nurturing care does help a little to assuage grief. Hi Anne, first let me say how sorry I am about Merlin. I know it’s heartbreaking when it’s time for them to leave us. You’re an absolute star for saving old dogs and giving them a loving home for however long they need one. I agree with you, there’s nothing better for the soul than knowing another old dog won’t die alone. I also rescue old dogs and people always tell me they couldn’t do it, and ask how I can. I tell them exactly what I just said – I’m the reason that dog won’t die alone and it brings me peace. I hope you find a new friend for Baby and feel free to share pictures! !